Kippure Estate, in its easy-to-reach, peaceful and inspirational location, is the perfect Ireland conference venue for workshops, seminars and business meetings. There are times when you need to get away from the office. 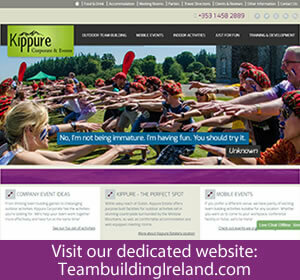 Whether it’s because you want to hold some staff training and don’t have space in your own premises, you want an impressive venue for your AGM, you need an inspirational location for your sales meetings, or maybe you just want to reward your staff, Kippure Estate has everything you need to ensure a smooth event. We have years of experience in hosting meetings for all types of organisations, from businesses to charities to church groups and with accommodation for up to 120 people, it’s easy to extend your event for as long as you need. Our beautiful setting in 240 acres of Wicklow countryside offer countless opportunities to relax and unwind between meetings and workshops so that participants come to each scheduled event refreshed and ready for business. We have all the equipment you might need to run your event, including audio-visual apparatus, and can set up the seating in your meeting room according to your requirements. All you need to do is let us know what you need. Nothing is too much trouble for our corporate events team. Our team of chefs will ensure everyone has plenty of good food during your time with us. We have a range of menus available to suit all budgets and requirements and we can even arrange something really special for you, such as a hog roast, BBQ or completely vegetarian meals. Once you’ve experienced what it’s like to hold an event at Kippure Estate, you’ll come back to us for all your special events, but don’t just take our word for it. Come and visit us and start planning your next corporate do.